Protecting children with a safe place to live and love with the gift of an education. CONSTRUCTION OF A HOME FOR EARTHQUAKE AFFECTED CHILDREN IN SOLUKHUMBU. The mega earthquake of 2015 that killed 9,000 people, destroyed 288,000 houses, and internally displaced 188,900 people, marked its third post-earthquake anniversary on April 24, 2018. Solukhumbu was hit hard, since it was one of the closest districts to the epicenter. Nepal’s Central Government, due to economic reasons, did not declare Solukhumbu as an emergency district. Because of that, recovery has been slow and is still ongoing, although today a high coordination between local government and development organisations has developed. 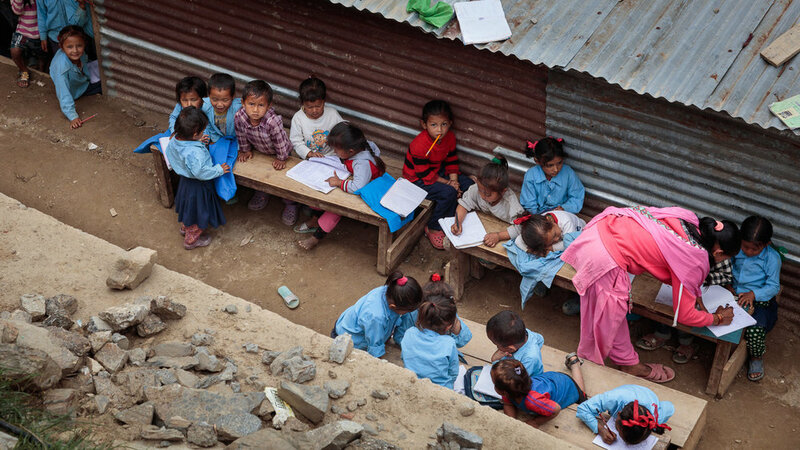 Since the Nepal Earthquake, we have been very busy providing much needed relief efforts, including rebuilding schools, family houses, and access to clean drinking water. During the course of our work, we have seen deeper challenges post-earthquake that especially concern the children who have suffered the loss of their families and homes. These children are at serious risk of child abuse, trafficking, and childhood marriages. It has been three years, but still many children have not been able to return to any form of schooling. It has been a while now, with no news about the earthquake, no photos of what is going on, larger international organizations have left, and donors have dwindled; but there is much challenging work on the ground post earthquake. And we continue working every day helping building schools, family houses, providing free medical care, and initiating other very important work to build homes for about 100 children to return to school and help raise them again with all your support. In this regard, the local Government & Authority of reconstruction in the central government has extended the call of support to us to help return children to school who still haven’t after the Nepal earthquake in our working district in Solukhumbu. We have initiated this very first project in Solukhumbu district to protect children who have been affected by the earthquake. Our project is to provide a safe place for them to live that would be very similar to our project in Kathmandu, but with a larger capacity for the benefit of about 100 boys and girls. They will have a safe place, nurturing care with love, and an education opportunity. It has always been experienced that slow recovery post disaster has high risk factors to children, making them more vulnerable than ever. These are defenseless children at risk of permanent dropout from mainstream education, ultimately making them more susceptible to the risks of trafficking, forced child labor, early marriage, and abuse. There are hundreds of children still awaiting much needed support. With local government calling out local NGOs to help support these children, TSW takes accountability for these children who, if not taken into refuge, are in direct threat of exploitation and abuse. Accommodations for sports including volleyball, football, basketball, badminton, table tennis, etc..
For the self-sufficiency and sustainability, we have enough land to grow our own vegetables and other foods as a part of teaching agricultural skills to students at home. $50 will help to buy school books and supplies for one child. $100 will help to cover school uniform expenses per child. $500 will cover yearly food expenses per child in the home. $1,000 will help to build student toilets in the home. $3,000 will help to install safe drinking water for 100 children. $4,000 will help to cover 50 children annual tuition fees. $6,000 will help to build a library room. $8,000 will help to build an auditorium for activities and events with a capacity for up to 150 children. $10,000 will help to build a kitchen and dining room to accommodate 100 people. The Small World long term supporter and honorable member Ruth sharing her vision about girls education and its impact in girls family, community & globally during her trip to Nepal.